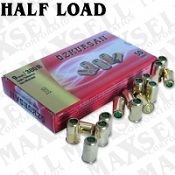 Image Below Or Add To Cart Pack of 50 9MM/380 Half Loads;. Our 9MM/380 Half Loads are about 60% as loud as our regular 9MM/380 blanks which are actually about as loud as a real hang gun being fired so these Half Loads are about 40% quieter than a real handgun being fired. Our 9MM/380 Half load Blank firing gun ammunition is ideal for blank gun use indoor, stage or any setting that calls for quieter shot when the blank ammunition is fired. 9MM/380 blank ammunition is for 9MM/380 Blank firing 1873 Peacemakers and all of our 9MM/380 blank firing REVOLVERS ONLY. Your Blank gun will have the correct type blanks used written on it. If it calls for 9MM, 380 or 9MM RK this is correct. These 380-9MM Blanks will NOT work in 9MMPA Automatic blank firing guns. Again these half loads are still about 60% as loud as a real hand gun being fired so if you need a quieter blank for a smaller theater setting you may need a 6MM/22 Blank Gun and the 6MM or 6MM/22LR Blanks to go with it.